Achilles Tendonitis can be very painful and debilitating, leading sufferers to reduce the amount of exercise they are doing, or even stop exercising altogether, and become less healthy as a result. However, there are many types of exercise that can be beneficial for your feet as well as for your overall health, and exercises specifically designed to help resolve Achilles Tendonitis can be extremely effective. An eccentric muscle contraction is one in which the muscle gets longer rather than shorter as it contracts. Eccentric strengthening exercises can be a very effective way of treating Achilles Tendonitis, with up to 90% of patients experiencing improvement or cure using the Hakan Alfredson’s heel drop protocol. Alfredson’s programme reassures patients that it isn’t a problem if their pain gets worse initially – this can be a part of the normal healing process. Alfredson also insists that heel drop exercises should be performed with the legs straight as well as bent, and that a total of 180 repetitions should be done every day for 12 weeks. Gastrocnemius heel drop. Stand with one foot on a step and the heel raised up. Lower the heel slowly, until the foot is parallel to the ground (keep your leg straight), then push back to the starting position using the uninjured leg to help. Repeat 15 repetitions, three times a day for 12 weeks. If two sets of 15 repetitions can be done without pain, increase the load by wearing a weighted vest or rucksack. Soleus heel drop. 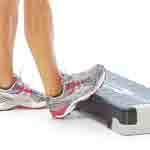 Stand as for the gastrocnemius heel drop exercise, but with your leg bent to 45 degrees. Raise the heel up high, then lower to horizontal (but no further), and return to the starting position using the uninjured leg to assist. Try three sets of 15 repetitions twice a day, for 12 weeks, and don’t worry if the pain gets worse initially. As above, increase the load when exercises become pain free. Gastrocnemius stretch. With the injured leg stretched out behind you, put the uninjured leg in front and lean forward, keeping your heel in contact with the floor. Repeat three times, holding the stretch for 20-30 seconds each time, several times a day. You should not experience pain during this exercise, but should feel the stretch in your calf muscle. Soleus stretch. As with the gastrocnemius stretch, the injured leg should be behind as you lean forward. This time, the back leg should be bent. Leaning against a wall is the best way to do this exercise, and you should feel the stretch lower in the back of your leg. Find Supportive Shoes in Ireland? The most important way to keep your feet fit and healthy is to ensure that you have well fitted, comfortable shoes that are suitable for your particular type of activity. It’s also important that your feet are kept in correct alignment during such activity. Pop into Foot Solutions today to get your feet measured & gait analysed. We can help you find the right footwear & support solutions to suit your individual needs.